The students will be presenting the research proposals they've been developing as a final project for this course. Everyone is invited to attend and there will be snacks available. Are ROLA and WREM just alphabet soup to you? Need to leverage internal funding to land that next external grant? Want to better understand the finer points of writing a grant, contract or an ethics application? On August 28, 2018, we will be hosting a one-day series of collaborative workshops, seminars and presentations to help you kick your research program into overdrive. We'll also have booths hosted by many support units that can save you time and increase your success (more information). The Centre for Teaching and Learning (formerly Teaching Support Centre) is hosting a full-day conference designed to showcase teaching innovations at Western, and introduce instructors to best practices in student-centered instruction which can enhance the student experience. This event is open to all; however, it is designed with instructors in mind. Keynote Session: "Valuing Teaching: What Matters Most?" by Peter Felten, Elon University (more information). This one-day conference introduces graduate students to teaching at Western and helps prepare them for their roles as Teaching Assistants. Conference highlights include a keynote presentation by an award-winning faculty member and a panel of experienced Teaching Assistants from across the disciplines. Participants choose from a variety concurrent workshops that focus on different teaching topics including: facilitating discussions, managing difficult situations, communication strategies, and more (more information). FIMS Seminar Series talks are Wednesday noon lectures for the FIMS and larger UWO community, offering an opportunity for FIMS faculty and graduate students to present their current research. Seminar Series talks are also great opportunities to test your ideas and receive feedback from a friendly, supportive audience. We are looking for faculty and graduate students interested in presenting this fall or winter. Faculty members are encouraged to also consider co-presenting with graduate students. If you are interested in presenting to the FIMS community – either alone or with collaborators, please contact Karen Kueneman at kueneman@uwo.ca. Amber Matthews, MLIS student, was awarded the Janette Baker Scholarship through the Ontario Library Association. The scholarship is meant to encourage people who are already working to participate in a formal full-time library and information science program. Rachel Melis, LIS PhD candidate, successfully defended her thesis, titled "Information Freedoms and the Case for Anonymous Community" on Monday, July 23, 2018. Grant Campbell, Associate Professor, and Nicole Dalmer, LIS PhD candidate, published the article "Communicating with library patrons and people with dementia: Tracing an ethic of care in professional communication guidelines" on August 2 in Dementia. MLIS alumni Cate Carlyle (currently the Curriculum Resource Centre coordinator at Mount Saint Vincent University) and Dee Winn (currently the head of information services at Concordia University Library), recently published a book titled Your Passport to International Librarianship, through ALA Editions. Chandell Gosse, PhD in Media Studies student, co-authored the article "I get by with a little help from my friends: The ecological model and support for women scholars experiencing online harassment" in First Monday. Co-authors include Jaigris Hodson, George Veletsianos and Shandell Houlden. Nelanthi Hewa, MMJC student, published her award-winning essay "Be a person first, a journalist second" in Western News on July 17, 2018. The essay won the Haak Saan Responsible Journalism Scholarship, established to promote and enhance social justice, peace and harmony, by encouraging highly responsible journalism. Paulette Rothbauer, Associate Professor, presented a paper entitled, "A Case of Reading While Old" as part of a symposium on "The Real-Life Consequences of Reading" at the Biennial Conference of the International Society for the Empirical Study of Literature (IGEL 2018), in Stavanger, Norway, 25-29 July 2018. Sam Trosow, Associate Professor, published two articles in the The Conversation, an open access, independent news and opinion source contributed to by the academic and research communities. The first article, co-authored with Bill Irwin, was titled "It's time to merge Ontario's two school systems" and was published on July 22. It was further explored by other local news sources after publication. The second article, titled "Fighting Doug Ford's threat to shrink Toronto city council" was published on July 30, and was later picked up and republished by the National Post. Professor Anabel Quan-Haase was interviewed by CBC London Morning on August 2. Quan-Haase was providing comment on Facebook's new app, which is designed to make people more aware of how much time they're spending on the social media platform. Romayne Smith Fullerton, Associate Professor, was featured in a London Free Press article, titled "Western professor probes crime coverage around world," published on August 7. Smith Fullerton was also featured in a Western News research profile, titled "What tell-all crime reporting says about us," published on July 20. Matt Stahl, Associate Professor, was featured in a research profile, titled "Labour laws historically out of tune with musicians," published in Western News on July 27. 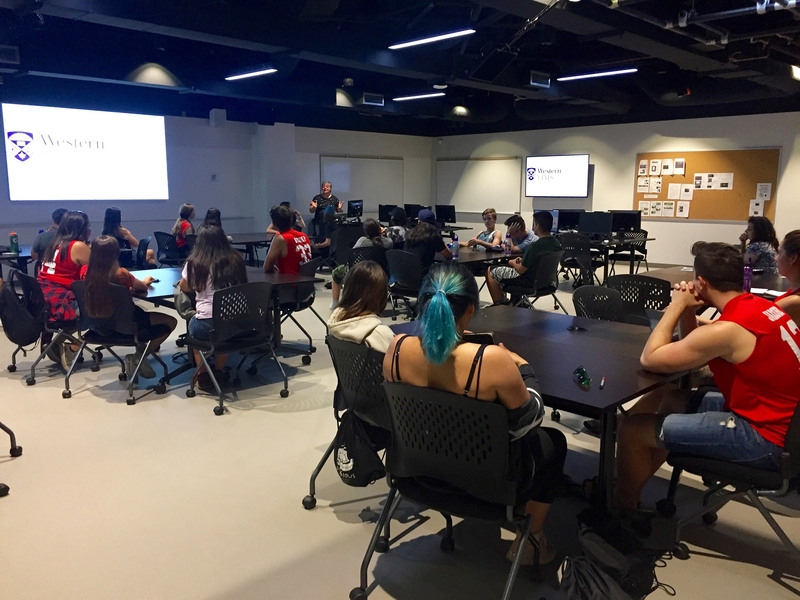 On July 24, FIMS took part in the second of the summer Mini-U for Indigenous students. About 25 campers, 11 -13 years old, learned about the faculty, journalism, storytelling and photography. 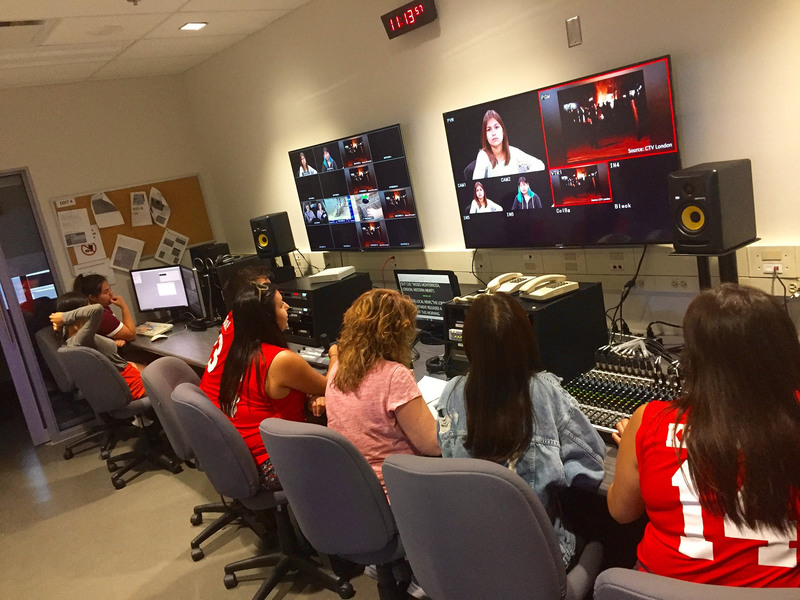 Erin Carroll, Paul Buckley-Golder, Jeremy Copeland, Susan Knabe and several FIMS students, including MMJC’s Mariam Mishriki, ran the workshops. Check out a photo. Check out another photo (both jpgs). Ziv Haddi, MMJC student, had his work broadcast on CBC London Morning on Monday, July 30. Titled "Finding purpose after a tragic accident," the radio doc features Julie Sawchuk, a Blyth resident, who became a paraplegic after being hit by a car while riding her bike. Alley Wilson, MA'14 (Journalism), currently a multimedia producer with Global News, launched an original YouTube show that premiered on August 1. Titled "Living in Colour," the series features a weekly panel with guests discussing their daily experiences as people of colour. If you are teaching in Fall 2018, please forward any course reserve requests to fimsreserves@uwo.ca, or stop by the service desk with your course outline and we'll help you out. This is the final summer issue of the Grad Bulletin. The next issue will be published on Monday, September 17. The deadline for submissions is noon on Friday, September 14.